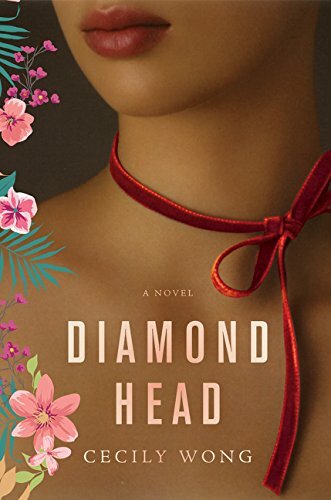 Diamond Head, the first novel by Cecily Wong, is filled with questions about fate, destiny, and choice. Wong chooses to tell the family Leong’s story through a framing device involving the death of the family patriarch, Bohai Leong. From limo pickup until the end of his funeral, Diamond Head is largely told through the eyes and memories of the Leong women. From rags to riches and back again, their experiences flesh out a complex family tale, travelling from the China of the Boxer Revolution through 1960s Hawaii. There is love, danger, and betrayal woven through the lives of 1964’s Theresa, 1941’s Amy, and 1914’s Lin, set against a backdrop of Chinese mysticism. According to Wong, Chinese folklore tells a tale of a red string that binds one life to another, that defines the person one is destined to love forever. If the person chooses to defy that string, a knot is formed that affects the lives of both the defiant one and subsequent generations. Wong’s characters live in the thrall of the red string, making and breaking alliances based upon tradition. It is the role of Theresa, the most American of them all, to decide if the red string of fate or choice will define the life of her family. In Diamond Head, Wong has crafted a delicate tower of mystery and history, and it’s difficult to review this book without giving away the plot points that make it all tick. Suffice to say that each family revelation is balanced upon another so precariously that to pull one out might spoil the reader’s enjoyment of slow revelation. Choosing to head hop between the Leong women was an inspired decision. Though it is tempting to view men of the late 19th and 20th centuries as the movers and shakers of society, in looking through the eyes of her women, Wong adds emotional depth to her story, while making it clear that women were more than decoration in a formative period of history. These women support families, fight wars, feed people, and live passionately—all under the radar of history. Wong’s prose is lyrical and nearly poetic: “Hong’s words are like an ocean’s tide, developing silently in the distance, bing pulled by the moon, gathering momentum as she reaches the shore, as she looms just before her point.” It would be easy to slip into platitudes and purple prose, but she avoids it neatly, wrapping her poetry in realism: “Most every week, from as long as I can remember, my father would threaten to sell me . . . He said he would sell me to an old, filthy slave owner, to a man with six concubines. If I didn’t obey him, I could disappear as easily as salt thrown in the ocean.” The beauty of the wealthy Leongs’ lives is under a shadow of death and sorrow, and Wong never lets the reader forget that. If there is one regrettable part of this lovely novel, it is that the character of Bodhi Leong remains a cypher. Though his father, Fa (or Frank) Leong is the head of the family, the one who brings them from the old century in China to the new territory of Hawaii, it is Bodhi’s life that defines a great portion of this novel; after all, it is his mother, wife, and daughter who tell the tale. Precious little is known of Bodhi, how he thinks or his view of life. It’s not even clear that he knows all of the stories that shape who he became. The thought of a glimpse into his head is tantalizing. The end of the story is a little pat, and not altogether believable, but it does little to dim the shine of this lovely novel. Cecily Wong will find it a difficult job to top Diamond Head.